The episode was directed by Dermott Downs and written by Anna Musky-Goldwyn and James DeWille. The earliest iteration of the Fortress was actually called the "Secret Citadel" and appeared in Superman #17 in 1942. Carved into a mountain outside of Metropolis, the Citadel made a few appearances before the first Fortress, which was located in the "polar wastes," took over. These locations were both later understood to have been on Earth-2. The first Earth-1 Fortress, then, appeared in 1958's Action Comics #241. There, it was a massive structure carved into the inside of a mountain and located in a remote mountain range in the Arctic. 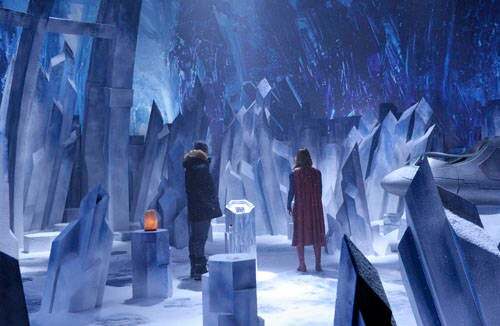 Typically, the Fortress of Solitude is located in the Arctic, though more over the years, the comics have placed the Fortress in other locations, including the Antarctic, the Andes, and the Amazon rainforest.